Background: Laparoscopic splenectomy (LS) has been established as a safe and effective alternative to open splenectomy (OS) for the treatment of appropriate patients with hematologic disease. 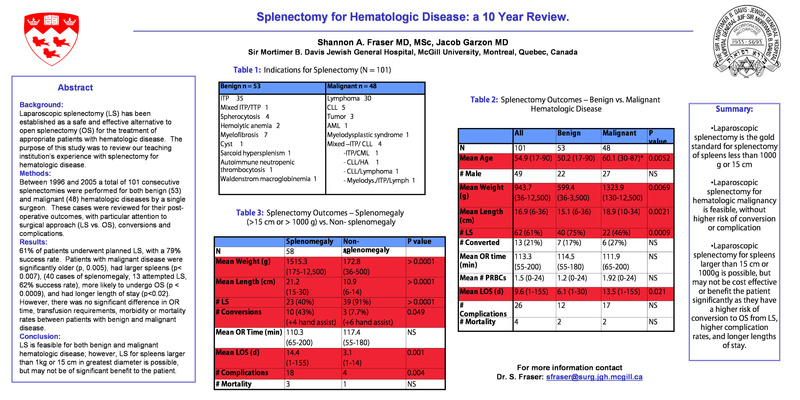 The purpose of this study was to review our teaching institution’s experience with splenectomy for hematologic disease. Results: 61% of patients underwent planned LS, with a 79% success rate. Patients with malignant disease were significantly older (p< 0.005), had larger spleens (p< 0.007), (40 cases of splenomegaly), more likely to undergo OS (p< 0.0009, 13 attempted LS, 62% success rate), and had longer length of stay (p< 0.02). However, there was no significant difference in OR time, transfusion requirements, morbidity or mortality rates between patients with benign and malignant disease. Conclusion: LS is feasible for both benign and malignant hematologic disease. However, LS for spleens larger than 1 kg or 15 cm in greatest diameter is possible, but may not be of significant benefit to the patient.